The Word of God says that "iron sharpens iron, and one man sharpens another" (Proverbs 27:17). Believe it or not, never has that verse seemed so real to me personally than when I'm engaged in some kind of discussion and Bible Study with others on the Internet. For all the negativity often associated with Social Media, I have to say that I've learned so much about Lutheran beliefs, teachings, and confessions from various Facebook Groups and other Lutherans online there. Sadly, in just several months, I've learned more from the one-on-one interactions I've had with virtual Lutherans online whom I've never met (both Pastors and laymen alike), than I've learned from the one-on-one interactions I've had with flesh-and-blood so-called "lifelong Lutherans" at the LCMS church that I used to belong to for several years. At my old church (and many others within Christianity today), this is exactly the type of thing that was regularly accepted and taught as truth week after week, rather than being the type of thing that should be exposed and refuted by any Lutheran church since it's so spiritually dangerous. Now, I'm sure some of you may be wondering what the big deal is. My gosh, come to think of it, I used to think and talk like that myself not too long ago! I mean, it sounds good, doesn't it? It sounds Biblical and tickles our ears too. That's the problem. See 2 Timothy 4:3 for specifics. An Evangelical friend posted this, with whole-hearted acclaim. 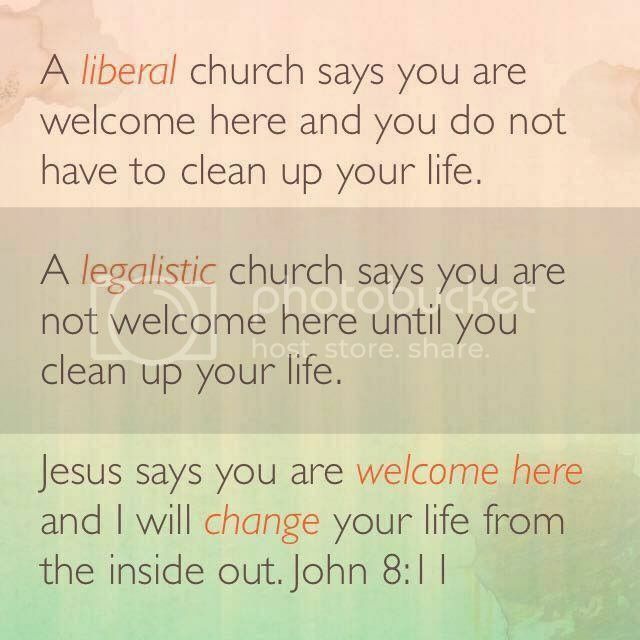 My reply (the only one) was: "And a Church that preaches Christ, and Him crucified and risen, says, 'You're messed up, you're sinful, as we ALL ARE. You can't fix it, you can't fix yourself, you will never do enough to earn righteousness. But thanks be to God, Jesus died for your sins. Believe on Him, He paid for it ALL. Believe and have life!'". What do you all think? I know that sounds a bit "Decision Based", but I didn't think I had time or space to put forward the ENTIRE Third Article. Personally, as an ex-Evangelical myself, I think she did a splendid job! She's absolutely right. The Third Article. Of Sanctification. What Does This Mean? Answer: I believe that I cannot by my own reason or strength believe in Jesus Christ, my Lord, or come to Him; but the Holy Ghost has called me by the Gospel, enlightened me with His gifts, sanctified and kept me in the true faith; even as He calls, gathers, enlightens, and sanctifies the whole Christian Church on earth, and keeps it with Jesus Christ in the one true faith; in which Christian Church He forgives daily and richly all sins to me and all believers, and at the last day will raise up me and all the dead, and will give to me and to all believers in Christ everlasting life. This is most certainly true. The Large Catechism expands up that quite nicely too. It may have been too much to share on Facebook within that context, but certainly not here. 35] This article (as I have said) I cannot relate better than to Sanctification, that through the same the Holy Ghost, with His office, is declared and depicted, namely, that He makes holy. Therefore we must take our stand upon the word Holy Ghost, because it is so precise and comprehensive that we cannot find another. 36] For there are, besides, many kinds of spirits mentioned in the Holy Scriptures, as, the spirit of man, heavenly spirits, and evil spirits. But the Spirit of God alone is called Holy Ghost, that is, He who has sanctified and still sanctifies us. For as the Father is called Creator, the Son Redeemer, so the Holy Ghost, from His work, must be called Sanctifier, or One that makes holy. 37] But how is such sanctifying done? Answer: Just as the Son obtains dominion, whereby He wins us, through His birth, death, resurrection, etc., so also the Holy Ghost effects our sanctification by the following parts, namely, by the communion of saints or the Christian Church, the forgiveness of sins, the resurrection of the body, and the life everlasting; that is, He first leads us into His holy congregation, and places us in the bosom of the Church, whereby He preaches to us and brings us to Christ. 38] For neither you nor I could ever know anything of Christ, or believe on Him, and obtain Him for our Lord, unless it were offered to us and granted to our hearts by the Holy Ghost through the preaching of the Gospel. The work is done and accomplished; for Christ has acquired and gained the treasure for us by His suffering, death, resurrection, etc. But if the work remained concealed so that no one knew of it, then it would be in vain and lost. That this treasure, therefore, might not lie buried, but be appropriated and enjoyed, God has caused the Word to go forth and be proclaimed, in which He gives the Holy Ghost to bring this treasure home and appropriate it to us. 39] Therefore sanctifying is nothing else than bringing us to Christ to receive this good, to which we could not attain of ourselves. 40] Learn, then, to understand this article most clearly. If you are asked: What do you mean by the words: I believe in the Holy Ghost? you can answer: I believe that the Holy Ghost makes me holy, as His name implies. 41] But whereby does He accomplish this, or what are His method and means to this end? Answer: By the Christian Church, the forgiveness of sins, the resurrection of the body, and the life everlasting. 42] For, in the first place, He has a peculiar congregation in the world, which is the mother that begets and bears every Christian through the Word of God, which He reveals and preaches, [and through which] He illumines and enkindles hearts, that they understand, accept it, cling to it, and persevere in it. 43] For where He does not cause it to be preached and made alive in the heart, so that it is understood, it is lost, as was the case under the Papacy, where faith was entirely put under the bench, and no one recognized Christ as his Lord or the Holy Ghost as his Sanctifier, that is, no one believed that Christ is our Lord in the sense that He has acquired this treasure for us, without our works and merit, and made us acceptable to the Father. What, then, was lacking? 44] This, that the Holy Ghost was not there to reveal it and cause it to be preached; but men and evil spirits were there, who taught us to obtain grace and be saved by our works. 45] Therefore it is not a Christian Church either; for where Christ is not preached, there is no Holy Ghost who creates, calls, and gathers the Christian Church, without which no one can come to Christ the Lord. 46] Let this suffice concerning the sum of this article. But because the parts which are here enumerated are not quite clear to the simple, we shall run over them also. 47] The Creed denominates the holy Christian Church, communionem sanctorum, a communion of saints; for both expressions, taken together, are identical. But formerly the one [the second] expression was not there, and it has been poorly and unintelligibly translated into German eine Gemeinschaft der Heiligen, a communion of saints. If it is to be rendered plainly, it must be expressed quite differently in the German idiom; for the word ecclesia properly means in German eine Versammlung, an assembly. 48] But we are accustomed to the word church, by which the simple do not understand an assembled multitude, but the consecrated house or building, although the house ought not to be called a church, except only for the reason that the multitude assembles there. For we who assemble there make and choose for ourselves a particular place, and give a name to the house according to the assembly. Thus the word Kirche (church) means really nothing else than a common assembly, and is not German by idiom, but Greek (as is also the word ecclesia); for in their own language they call it kyria, as in Latin it is called curia. Therefore in genuine German, in our mother-tongue, it ought to be called a Christian congregation or assembly (eine christliche Gemeinde oder Sammlung), or, best of all and most clearly, holy Christendom (eine heilige Christenheit). 49] So also the word communio, which is added, ought not to be rendered communion (Gemeinschaft), but congregation (Gemeinde). And it is nothing else than an interpretation or explanation by which some one meant to explain what the Christian Church is. This our people, who understood neither Latin nor German, have rendered Gemeinschaft der Heiligen (communion of saints), although no German language speaks thus, nor understands it thus. But to speak correct German, it ought to be eine Gemeinde der Heiligen (a congregation of saints), that is, a congregation made up purely of saints, or, to speak yet more plainly, eine heilige Gemeinde, a holy congregation. 50] I say this in order that the words Gemeinschaft der Heiligen (communion of saints) may be understood, because the expression has become so established by custom that it cannot well be eradicated, and it is treated almost as heresy if one should attempt to change a word. 51] But this is the meaning and substance of this addition: I believe that there is upon earth a little holy group and congregation of pure saints, under one head, even Christ, called together by the Holy Ghost in one faith, one mind, and understanding, with manifold gifts, yet agreeing in love, without sects or schisms. 52] I am also a part and member of the same, a sharer and joint owner of all the goods it possesses, brought to it and incorporated into it by the Holy Ghost by having heard and continuing to hear the Word of God, which is the beginning of entering it. For formerly, before we had attained to this, we were altogether of the devil, knowing nothing of God and of Christ. 53] Thus, until the last day, the Holy Ghost abides with the holy congregation or Christendom, by means of which He fetches us to Christ and which He employs to teach and preach to us the Word, whereby He works and promotes sanctification, causing it [this community] daily to grow and become strong in the faith and its fruits which He produces. 57] Meanwhile, however, while sanctification has begun and is growing daily, we expect that our flesh will be destroyed and buried with all its uncleanness, and will come forth gloriously, and arise to entire and perfect holiness in a new eternal life. 58] For now we are only half pure and holy, so that the Holy Ghost has ever [some reason why] to continue His work in us through the Word, and daily to dispense forgiveness, until we attain to that life where there will be no more forgiveness, but only perfectly pure and holy people, full of godliness and righteousness, removed and free from sin, death, and all evil, in a new, immortal, and glorified body. 61] This, now, is the article which must ever be and remain in operation. For creation we have received; redemption, too, is finished But the Holy Ghost carries on His work without ceasing to the last day. And for that purpose He has appointed a congregation upon earth by which He speaks and does everything. 62] For He has not yet brought together all His Christian Church nor dispensed forgiveness. Therefore we believe in Him who through the Word daily brings us into the fellowship of this Christian Church, and through the same Word and the forgiveness of sins bestows, increases, and strengthens faith, in order that when He has accomplished it all, and we abide therein, and die to the world and to all evil, He may finally make us perfectly and forever holy; which now we expect in faith through the Word. 63] Behold, here you have the entire divine essence, will, and work depicted most exquisitely in quite short and yet rich words, wherein consists all our wisdom, which surpasses and exceeds the wisdom, mind, and reason of all men. For although the whole world with all diligence has endeavored to ascertain what God is, what He has in mind and does, yet has she never been able to attain to [the knowledge and understanding of] any of these things. 64] But here we have everything in richest measure; for here in all three articles He has Himself revealed and opened the deepest abyss of his paternal heart and of His pure unutterable love. For He has created us for this very object, that He might redeem and sanctify us; and in addition to giving and imparting to us everything in heaven and upon earth, He has given to us even His Son and the Holy Ghost, by whom to bring us to Himself. 65] For (as explained above) we could never attain to the knowledge of the grace and favor of the Father except through the Lord Christ, who is a mirror of the paternal heart, outside of whom we see nothing but an angry and terrible Judge. But of Christ we could know nothing either, unless it had been revealed by the Holy Ghost. 67] From this you perceive that the Creed is a doctrine quite different from the Ten Commandments; for the latter teaches indeed what we ought to do, but the former tells what God does for us and gives to us. Moreover, apart from this, the Ten Commandments are written in the hearts of all men; the Creed, however, no human wisdom can comprehend, but it must be taught by the Holy Ghost alone. 68] The latter doctrine [of the Law], therefore, makes no Christian, for the wrath and displeasure of God abide upon us still, because we cannot keep what God demands of us; but this [namely, the doctrine of faith] brings pure grace, and makes us godly and acceptable to God. 69] For by this knowledge we obtain love and delight in all the commandments of God, because here we see that God gives Himself entire to us, with all that He has and is able to do, to aid and direct us in keeping the Ten Commandments-the Father, all creatures; the Son, His entire work; and the Holy Ghost, all His gifts. Clearly, she was right in her response, and it's the type of thing that we Christians can never hear enough of, in my humble opinion. Other Lutherans chimed in with some additional godly wisdom too. Matthew L: Yeah number three... So I was welcomed, but eventually began to realize that the inside out "change" didn't take. And of course, that's MY fault, so I need to at least try to meet Jesus half way. I'm just telling you the direction of the thing. In the so called "good news" of number three, the promise is you'll be accepted and changed. So you're accepted, but the change never takes hold. There's not staying power for the sanctification you're supposed to get when Jesus is changing your life from the inside out. So you're told that it's because your somehow resisting, so you have to meet Jesus halfway on this change thing or it wont take hold. In the meantime, the countdown clock is ticking towards eternity, where you'll be judged if the change from the inside out doesn't take hold. Christopher H: What kind of Savior says meet me half way? I'll take one who says I did it all, I am doing it all, I will do it all. It is finished! Becca L: And, with number 3, eventually you realize you're still a sinner and basically can't be good no matter how hard you try, so you think "wow, maybe I'm not really saved. Maybe I didn't "accept Jesus" sincerely enough. So that road leads to despair and maybe a complete loss of faith. James B: The third phrase is merely the second phrase in disguise. Becca L: On the original post, only one person liked my input. I guess admitting that you're a poor, miserable sinner who has been redeemed wholly by the work of Jesus isn't a popular stand. Ah, well, I can live with being unpopular. I like it when posts like this write themselves thanks to the generous contributions of others in other places, especially when the teaching is so good (and so needed!) in the current spiritual wasteland that is American Evangelicalism. In a Lutheran layman's terms, why wouldn't we want Christ's Church when we compare it to American Evangelicalism's brand of church?